Originally named Sidney after its developer, the name was later changed to Port Orchard at the request of the residents. Church services are first recorded in 1886 with the congregation being formally organized two years later as the Church of Christ. The group built the first church building in the community in 1889. Henry Owen Shuey, a Seattle banker, was the first minister and there were 17 charter members. Another records reports that Elder A. B. West of Centralia was also involved in the onset of the church. Charter members were: James H. Cline, Jane Cline, L. A. Cline, Moses B. Cline, Ruth Cline, Susan Cline, Thomas Cline, William Cline, H. C. Gilbert, Lydia Gilbert, Mary Mosbarger, Milton Mosbarger, A. J. Parker. Ellen Scott, Jane Small, W. J. Small and Sadie Sroufe. Mr. Shuey was of French Huguenot ancestry and born in Indiana in 1861. His brother, Thomas J. Shuey, was a noted minister of the Christian Church in the Mississippi Valley and finished out his life in Seattle. While many preachers of the time were farmers or artisans, Henry O. Shuey had extensive business interests in Seattle. One writer said that he was instrumental in erecting houses, which, if placed in a line one house to each fifty feet, would reach more than ten miles. located at SE corner of Harrison and Dekalb. This congregation was the site of a debate between W. F. Smith and Elder A. W. Steers of the Christian Advent Church. Mr. Smith argued that the kingdom of Daniel 2:44 was already here (the church), that Christ was now King over his kingdom and that those who have already died are not sleeping until some future time, but are aware now. The debate was moderated by Rufus H. Moss of Seattle. The debate was held in 1890 and W. F. Smith appears to be the preacher at that time. By 1893, C. M. Barnes was the preacher and they were trying to raise money for a protracted meeting. N. G. Ross filed a report with the Christian Standard in 1894 about a successful meeting with J. T. Eshelman. Mr. Ross does not appear any where else as a preacher, so the church may not have had one that year. Once known as Apple Tree Cove, the name Kingston is a contraction of King's Town. In the spring of 1888, two members of the Missionary Baptist church, John D. Patterson and E. W. Townsend, came to Kingston, then known as Apple Tree Cove, in search of home sites. . . Several Christian families joined them. After a year a Sunday school was organized, with John D. Patterson as superintendent. . . Following the Sunday school, a prayer meeting was held, but no church organization was attempted. A year later Elder W. F. Smith came from Quick, Iowa, and began to preach, and on April 7, 1889, the baptized believers were organized into a church, with fifty-five charter members. The first observance of the Lord's Supper was on April 14, 1889. For several weeks following the organization of the church, there was at least one confession of faith and baptism each Sunday. On June 2, 1889, Elder Smith was officially elected minister to give one-fourth of his time on the basis of freewill offering. In September of 1889 the Apple Tree Cove church elected John D. Patterson to represent them for the first time at the state convention held in Waitsburg. Other members of the church also attended this convention. Charter members included: Jasper Dow, Mary Page, R. S. Parkhurst, Mary Parkhurst, Ora Parkhurst, John D. Patterson, Luella Patterson, C. L. Ramsey, Roger S. Spaulding, Belle Smith, L. H. Smith, Martha Smith, W. F. Smith, Arthela Stoner, and Jacob Stoner. Services were conducted by the members in the earliest years. Communion was held regularly, but was omitted from one service because the brother in charge "failed to bring the bread." Church discipline was practiced in their pioneer church. The minutes record that the church withdrew "from J. D. Patterson and Lizzie Hobgood for unruly conduct." Note that Patterson had led in founding the congregation. 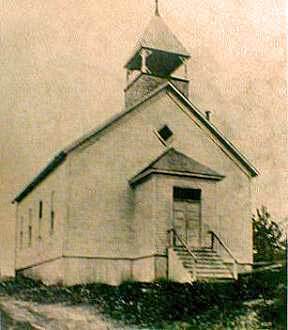 By 1889, the church was able to afford a building 26 x 30 feet. Attendance at one typical service was 48, including the children.